Rain, rain, go away. On this drab morning in New York, all I want is be to cozy, but not forget that spring color + warmth we’re feeling. Too much to ask. Yes of course is it. but this Silver and Prawn Duo Jumper by Humanoid arises as today’s self expression, I’m-in-the-Mood-for garment. 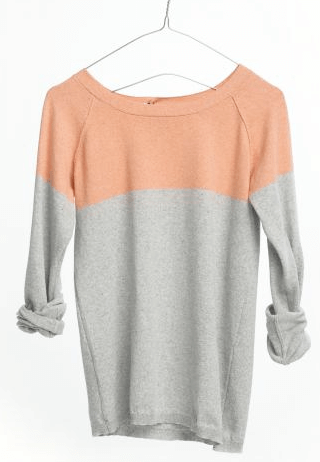 And because Humanoid is a fabulous company (this sweater is made with 30% recycled cotton) they make it to the top of this week’s Weekly Want.